Do animals also get cataracts? Have you ever wondered if animals are also affected by cataracts just like humans? The answer is, YES, as with most human diseases and conditions, animals are also affected by this condition. 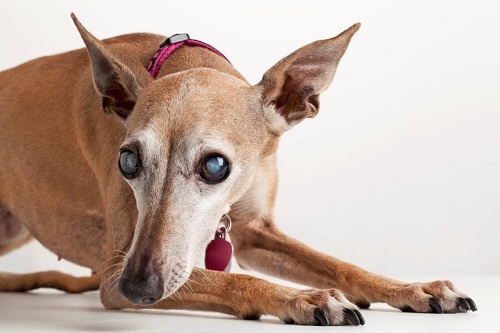 In this article we will look at how dogs are affected by cataracts, what causes it, the prevention and treatment, and the consequences if left untreated. The lens is the structure within the eye that enables us and animals to see far and near and to focus. A cataract is an opacity within the lens or lens capsule which reduces the passage of light through the lens that can affect vision and will eventually cause blindness. Cataracts prevent light from reaching the nerve centre of the eye, known as the retina. A cataract may start as a small cloudiness within the lens that gradually enlarges as it matures. It is very difficult to predict the progression of the cataract but it most often results in blindness. Do all dogs develop cataracts? As dogs mature and get older, the lens hardens and takes on a bluish grey appearance. This is known as nuclear sclerosis. The colour can increase as the dog ages but generally it does not cause blindness. The lens becomes less flexible and so close-up focussing is affected. Dogs do not have good close-up vision so the effect of this is usually minimal, unlike in humans who, as we age, generally need glasses for close-up vision such as reading. It is often difficult to tell the difference between nuclear sclerosis and a cataract and some older animals may have both. Your pet may need to be assessed by a veterinary ophthalmologist who has specialised equipment to assess what exactly is going on in the eye. There are several different causes of cataracts. Some breeds of dogs have a hereditary (genetic) predisposition to developing cataracts. They can occur at any age. Some may develop fairly rapidly over a few weeks, whereas others may take years to mature. A large percentage of dogs with Diabetes mellitus will develop cataracts shortly after becoming diabetic. Trauma to the eye such as a perforating foreign body that touches the lens can induce cataract formation. Severe inflammation or retinal disease may also lead to cataract formation. Such diseases include uveitis or progressive retinal atrophy (PRA). Cataract formation can be secondary to ageing. Age related cataracts are often small and do not always interfere with vision. There are many other potential causes of cataracts in dogs, such as birth defects, infection, radiation (usually from prolonged radiation therapy for cancer of the head) or even electrocution (for example a dog biting an electrical cable). A preliminary examination by your veterinarian will give an indication if it is a cataract causing cloudiness in your dog’s eye or another condition. Most veterinarians will then refer you to a veterinary ophthalmologist who has the expertise to distinguish the extent of the cataract and possible treatment options. A veterinary ophthalmologist is a veterinarian who studies for a further four years after qualifying as a vet to become a specialist, the same as you find in human medicine. Is there anything that can be done to prevent cataracts from forming? In most cases the development of cataracts cannot be prevented. In certain conditions, such as diabetes mellitus the extent of the cataract can be reduced with early detection of the disease. It is important to examine your dog’s eyes often and if any cloudiness is noted, to take your pet to the vet. Take note of your dog’s vision and if you notice that he or she may be struggling to see it is another indication to seek veterinary help. If there has been trauma to the eye it is another indication that cataracts may develop. Loss of vision due to cataracts may be restored through surgery but a veterinary ophthalmologist will have to assess whether your pet is a candidate for surgery. The lens is surgically removed and may be replaced with a plastic or acrylic lens. Although the surgery does have a good success rate, the post- operative care is extensive and unfortunately not all animals are surgical candidates. It is important to get underlying conditions such as diabetes mellitus under control before pursuing the surgical route of treatment. What happens if a cataract is left untreated? If a cataract is left untreated, it may luxate or slip from the tissue that holds it in its place. If this happens, it may float around the eye and block the drainage of the eye leading to glaucoma which is a buildup of pressure inside the ball of the eye. Glaucoma is a serious condition and may lead to permanent loss of vision. Cataracts may also begin to dissolve with time, causing pain and inflammation of the eye. As with humans severe cataracts will result in blindness if left untreated. Not all cataracts can be treated so it is important to regularly monitor the eye and if concerned, then take your pet to the vet.